Last but not least and probably the coolest thing about being a senior is my ability to be rude without anyone being aware of it. If people are jabbering on about inconsequential nonsense I can pretend to not hear them. After the third “What, huh!” they tend to wander off to bother someone else. I can also get a confused look on my face and start to ask questions of them that are not pertinent to the current conversation. Their first thought is that I’m having a memory loss or possibly early onset Alzheimer’s. Either way they also tend to wander off to talk to someone else very quickly. It makes my life a little more interesting and at times humorous. 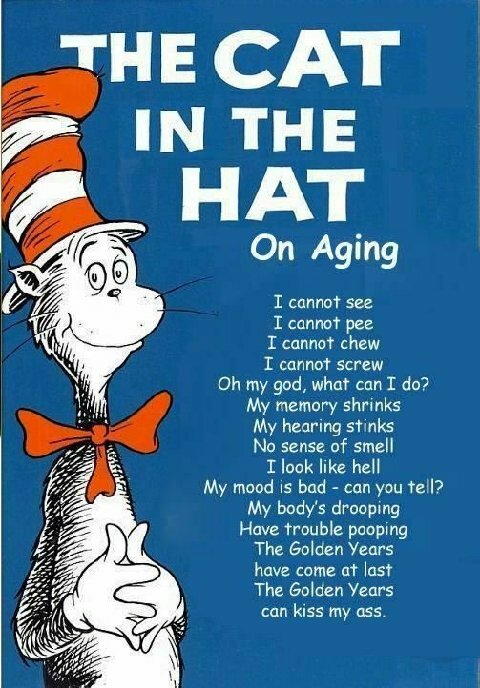 Speaking of humorous, here’s some senior humor that I particularly like since it’s about cops and senior citizens. Being an ex-cop and now a Senior it seemed an excellent way to end this post. An elderly man, from Georgia, was going up to bed, when his wife told him that he’d left the light on in the garden shed, which she could see from the bedroom window. He opened the back door to go turn off the light, but saw that there were people in the shed stealing things. Then the police dispatcher said “All patrols are busy. You should lock your doors and an officer will be along when one is available.” The old guy said, “Okay.” He hung up the phone and counted to 30. Then he phoned the police again. “Hello, I just called you a few seconds ago because there were people stealing things from my shed. Well, you don’t have to worry about them now because I just shot them.” and he hung up. Within five minutes, six Police Cars, a SWAT Team, a Helicopter, two Fire Trucks, a Paramedic, and an Ambulance showed up at the residence, and caught the burglars red-handed. « 06-01-2018 Things That Really Bore Me!